The Roman Catholic Church of Jesus the Merciful – сatholic relic of Vitebsk. Vitebsk - is not only a centre of industrial and cultural life of Belarus. There are a lot of old and new churches and temples, among which the Roman Cathedral Church of Jesus the Merciful vividly stands out, opened in October 2009. 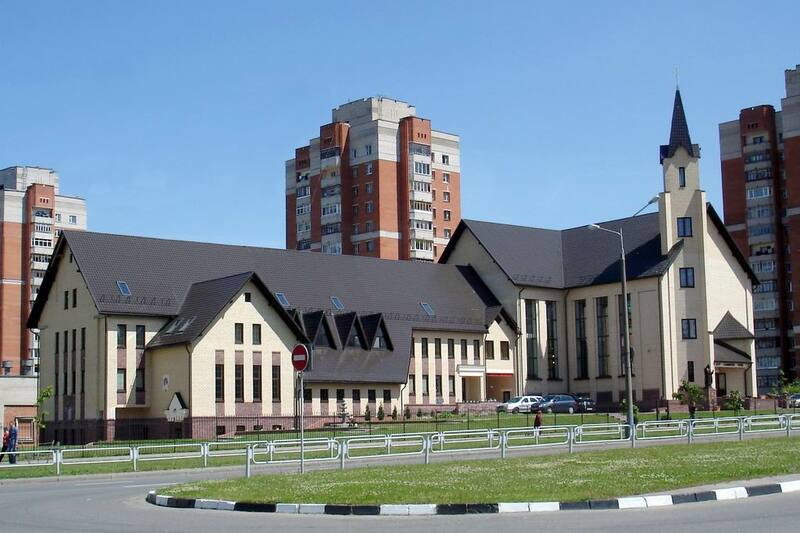 Church is outstanding because it occupies central place in Vitebsk diocese and can hold over 1500 worshipers. It is the first Catholic Church built in Vitebsk for the last 124 years. If you look at the history of the city, you can see that before the revolution 1917 there were about 10 Catholic relics in Vitebsk, most of which was destroyed by Soviet authorities. Alas, the history of the city of Vitebsk is a story of losses. By the beginning of the new millennium in the city remained only three Roman Catholic churches with the Roman Catholic Church of St.Barbara being the main which has been acting since 1885, so there was almost nothing to see in Vitebsk for Catholics from other countries. District "South-7", in which the building of the Roman Cathedral Church of Jesus the Merciful in 2000 began to be constructed, has approximately 200000 residents, many of whom are Catholics who attend roman catholic churches in Vitebsk, and therefore there has been the need for the construction of a new church for a long time. In 2000 the temple was a small chapel, and in 2004 the foundation stone was laid not far from the regional hospital. Now we can see the magnificent building in the shape of a cross 32 meters height, an excellent example of sacral architecture of Vitebsk. The dedication of the church took place in October 2009 by Vitebsk Bishop Vladislav Blin, and in April 2010 the church opened a youth cultural and religious center. It is noteworthy that this is the 77th Catholic Church in Vitebsk region. Along with it there are still three Catholic temples in Vitebsk - the Roman Catholic Churches of the Holy Spirit, St.Anthony and Roman Catholic Church of St.Barbara, being beautiful monuments of architecture of Vitebsk. At this time, the temple has the proud status of a cathedral, and the document of assignment was signed by Pope Benedict XVI. On June 18, 2011 the solemn ceremony of awarding the status took place in the cathedral, which was attended by the faithful not only from Belarus, but also from some European countries. The celebrations began with Corpus Christi procession through the streets of Vitebsk. 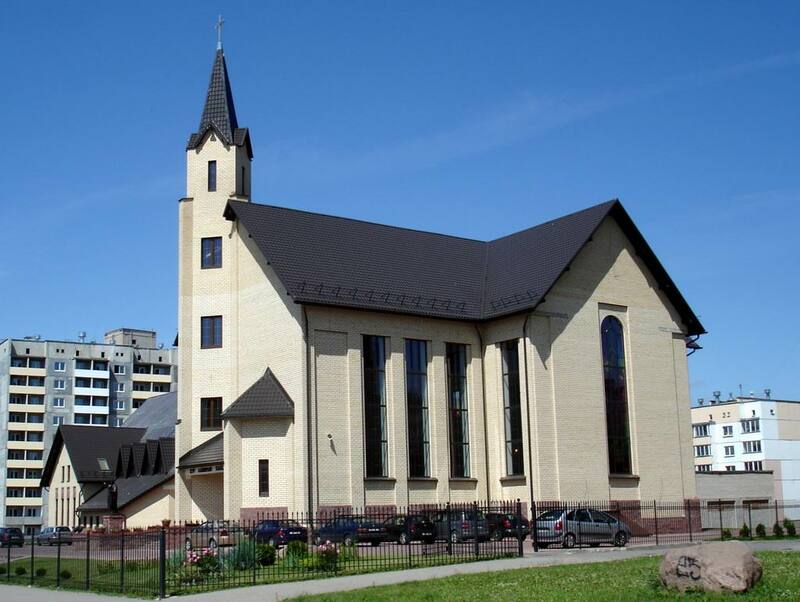 On April 8, 2010 the Cathedral Roman Catholic Church of Jesus the Merciful was visited by Ambassador of France to Belarus Michel Raineri, who noted that the construction of a new church has made a huge contribution to the culture of Vitebsk. The church operates charity Catholic Society Caritas holding exhibitions of art works of gifted youth. The society provides support to people with disabilities. 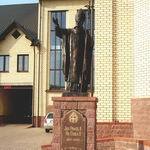 You can see the works of Caritas on any Catholic Vitebsk site. 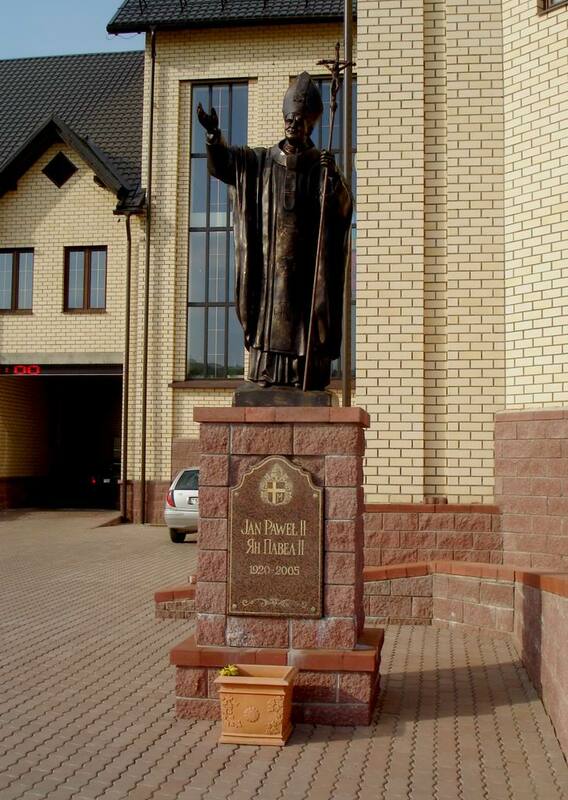 On the territory of the church there is a Monument to John Paul II, dated to the 30th anniversary of his election as Pope. The monument features the pontiff, blessing worshipers with a cross. The sculpture is about 4.5 meters. On a red granite board an emblem of Pope John Paul is stamped with his name on the Polish and Belarusian languages. The monument was donated to Belarusian faithful by the Polish Catholics and immediately became a new sight in Vitebsk. 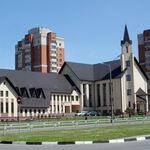 You can find the Roman Cathedral Church of Jesus the Merciful to the address: 28 Soldiers-Internationalists street. Referring to such site of Vitebsk as city portal VitebskCity.by, you can learn a lot of interesting information about this outstanding monument, look at its photos and learn about other churches in Vitebsk. If you wonder, what to see in Vitebsk, please visit the Temple of St.Andrew the First-Called and the Temple of the Icon of the Mother of God "Healer". Among the interesting sights of Vitebsk it should be noted the building the Ice Palace which holds sport events and exhibitions and located near the Roman Cathedral Church of Jesus the Merciful. The history of the city of Vitebsk would be incomplete without mentioning the Afghan war participants, whose names are chased on the Monument to Soldiers-Internationalists, that is a few hundred meters from the church.